Join us to celebrate our 30th Anniversary Year! 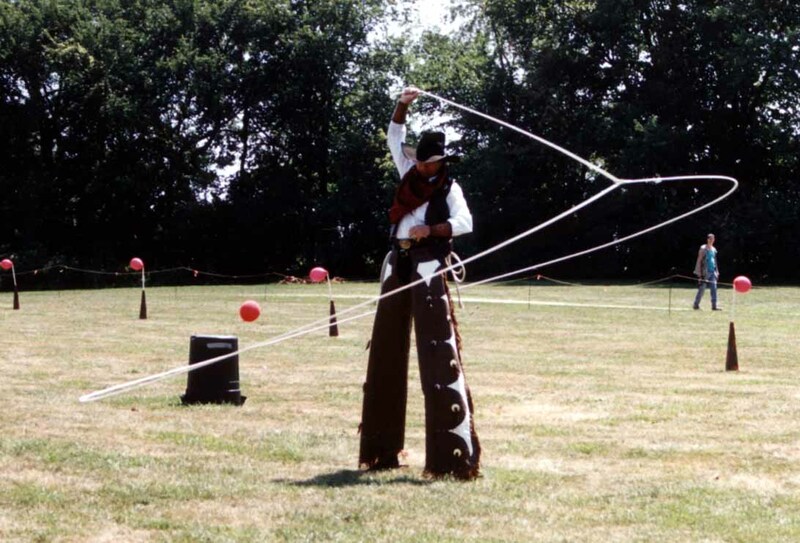 Roper's Gathering and "Cowboy Schoolhouse"
Seminars and contests - learn to spin a rope, crack a whip or twirl a gun. Keeping the "Western Arts" alive! KG & The Ranger's 30th Anniversary Celebration Concert! Entrance on Brearly Street. Free parking in the lot across the street. Admission: $2 members, $4 general public. We like to make our special anniversary concerts fun and different, so expect some prize give-aways and other surprises in addition to a "retrospective" of songs from 30 years of performing together. Shy Ange, aka Angie Roltgen Otte, will be joining us. House band "Staff Infection" starts the night 6-7:15 pm followed by our show from @ 7:30-9:00. "Shy Ange" (our daughter, Angie Roltgen) will join us to make this a trio show! Beloit Senior Center "Western Hoedown"
Open to the public - attendees must order food (prices are reasonable and the food is good). More shows filling in all the time - please check back often! Want to know what shows are coming up? Dec 2016 - Looking back on another year filled with good music and good friends. We don't have any big announcements this year, but just keep riding along on our mission to keep classic Western Music alive. We have had some great shows playing with our daughter and son-in-law in our "expanded" version of KG & The Ranger. Hope to book lots more shows with them down the trail! One of the highlights this year was our trip to Albuquerque NM for the Western Music Association convention, where we were blown away by the talented youngsters who are playing this music and moving it into a new generation. Dec 2015 - YES! ANOTHER NEW CD filled with Classic Christmas songs and unique cowboy Christmas songs! We had a ton of fun recording this with all six of our grandkids taking part, plus our grownup "kids" and their spouses. A real family get-together for the Holidays! Check out the Trading Post for all the details on 'Tis The Season. Hard to believe it's been 10 years since our last release. Guess we've just been too busy having fun performing all around the country to get in studio time! But the wait is over - and we are very excited about our new project. We have excellent backup on vocals and bass from our daughter Angela Otte and her husband Tom Otte. And we finally had a chance to work with fiddler Suzanne Lansford, who we met about 5 years ago in Okeechobee Florida. It's a long story, but from the first time we heard her play we knew we had to record with her someday. She adds so much to the album - you will love her playing. The concept for this album came from our love of the poetic, lyrical songs in Western Music. Some of these we sing just for ourselves, or around a campfire with friends - seldom performing them on stage. Others are gems of the genre that we sing for all occasions. They are all favorites of ours and needed to be recorded. KG & The Ranger were inducted into "America's Old Time Country Music Hall of Fame", located in the Pioneer Musem in Anita IA! This is a nice honor from the National Traditional Country Music Association. The induction ceremony took place during the NTCMA Old Time Country Music Festival in LeMars IA, August 29 - Sept. 4, 2011. For more info go to the NTCMA website: www.orgsites.com/ia/oldtimemusic. 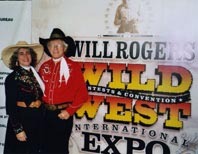 KG & The Ranger awarded the Western Music Association"Outstanding Entertainer - Duo" of the year! We are so thrilled and honored by this award from our fans and peers in Western Music. MANY THANKS TO ALL OF YOU! Winners are nominated and voted on by the entire WMA membership. The award was presented in Albuquerque NM at the WMA Awards Banquet, the grande finale of the annual Showcase and Awards Festival. This festival is a gathering of top notch western music performers from around the country and fans from around the world - a “Who’s Who” event of cowboy musicians. For a complete list of categories and this year’s WMA winners please see www.westernmusic.com/awards-finalists.html. November 21, 2007 - NEW AWARD! 1st Place winners of the Western Music Association Harmony Contest. Another plaque to add to our "Wall of Fame" - and a great honor to be part of the Western Music Association's 19th annual festival and convention. The halls of the Albuquerque Marriott Hotel rang with Western Music last weekend as musicians gathered from all corners of the country (and even from overseas) to learn about, celebrate and perform Western Music. 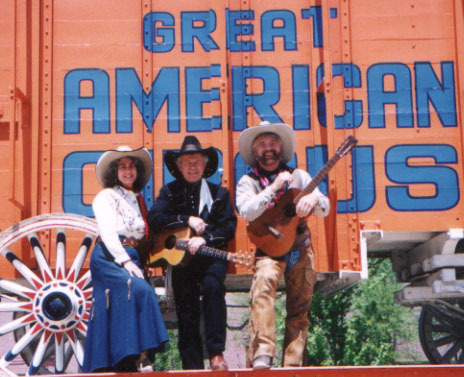 To learn more, visit www.westernmusic.org. 2007 is galloping by, with lots of great musical adventures. We were privileged to be part of two grand 100th Birthday Celebrations this year: Gene Autry's and John Wayne's. Both events drew folks from all over the country and the world and were great successes. 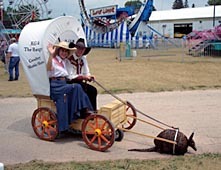 Our summer was spent entertaining at County Fairs and events around Wisconsin, and the fall took us to South Dakota and Oklahoma. KG was honored to be one of five finalists for the Academy of Western Arts "Yodeler of the Year" (congratulations to Chelsea Beck, the winner). November 2005 - Three's the charm! 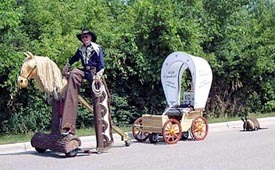 For the third time, KG & The Ranger won the Western Music Association title of "Harmony Yodeling Champions". The contest was held at the annual Western Music Festival in Albuquerque NM. Yodel - ay - dee - hoo! 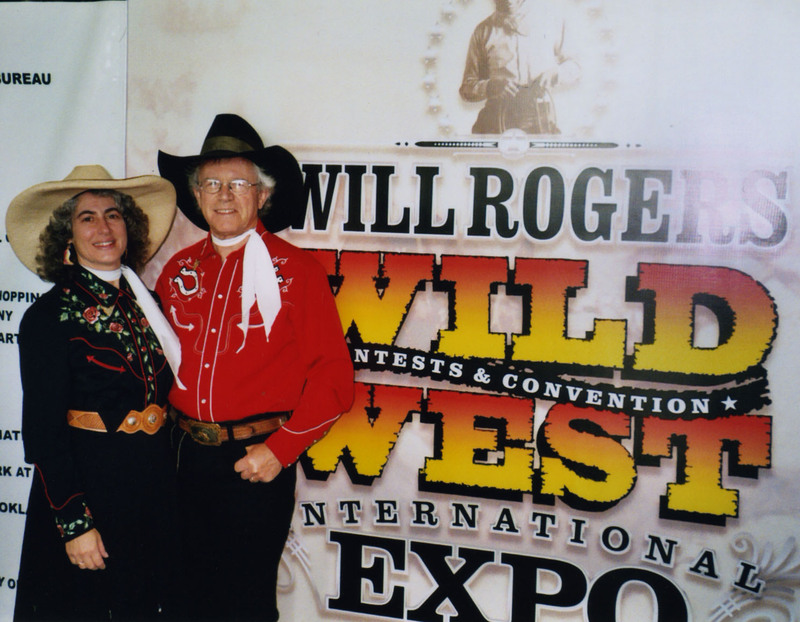 April 2005 - The Wild West Arts Club presented KG & The Ranger with the 2005 "Montie Montana Showmanship Award" at the WWAC 16th Annual International Convention in Claremore OK. This prestigious award is given to artists chosen by a panel of judges, including Montie Montana Jr., to honor excellence and professionalism in Western Arts performance. Click on photo to download printable photo. September 2004 - TROPHIES & PARADES! This must be the month for awards for KG & The Ranger. We won 3rd place (out of 16 contestants!) in the Minnesota Bluegrass Association's duet singing contest. We took 2nd place with our new parade rig in the New Lisbon Sesquicentennial Parade! 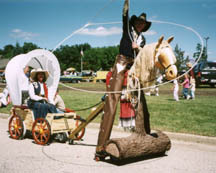 August 2005 update - we won an award for "Most Original" in the Edgerton Tobacco Heritage Days Parade. Check out our album "When Cowboys Dream"
This is a wonderful collection of songs - including Ranger Rick's newest composition Happy Dreaming Cowboy, plus rare and vintage cowboy songs. We had the fun of working with the same great musicians we have recorded with in the past - Rodeo Kate on fiddle, Dave Fallow on guitar and Steve Kasprzac on bass. Recorded at Randy's Recording, our thanks go out to Randy for all his support and good advice. 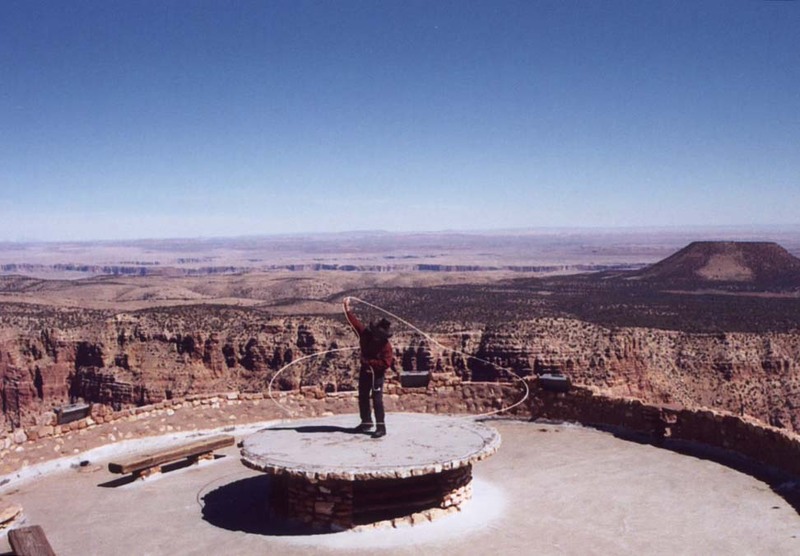 Ranger Rick spins out his 50 foot rope at the Grand Canyon! Milwaukee's Veteran's Park went "wild" - Wild West, that is! It was a great festival with a great response to the Wild West Revue. KG & The Ranger once again take home honors from the Western Music Association. They are the 2002 International Harmony Yodeling Champions - winning this award for the second time (1999 was the first). They also were nominated by the WMA for the prestigious "Crescendo Award" which honors accomplishments in Western Music. Visit the WMA website for more information about the WMA and the festival. 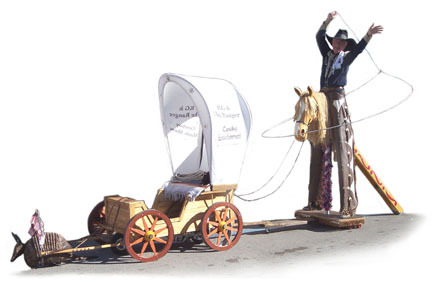 Cowboy music is "family friendly" music with wholesome lyrics and a positive message for kids. KG & The Ranger have taken their Cowboy Music program to many schools, preschools and libraries across the country. This album was inspired by these experiences and by the fascination kids everywhere have for the American Cowboy. 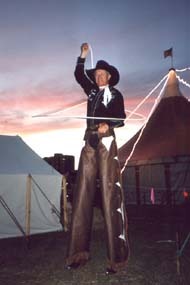 Meet Short-cut Curly, the eight-foot tall cowboy and the newest member of our Western show. Be sure to look for him to make an appearance at our up-coming performances - you never know when he'll show up! This year has seen many accomplishments, including being nominated by the Academy of Western Artists for Rising Star of 2001, and also being in the top 5 finalists for the Western Music Association's new "Crescendo Award" - a fans' choice award for excellence in Western Music. 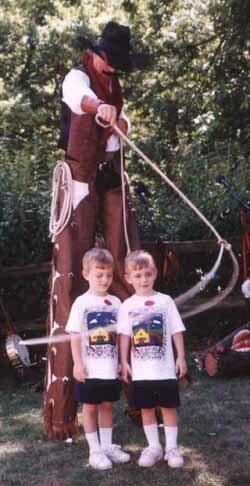 KG & The Ranger are the 1999 WMA Harmony Yodeling Champions!